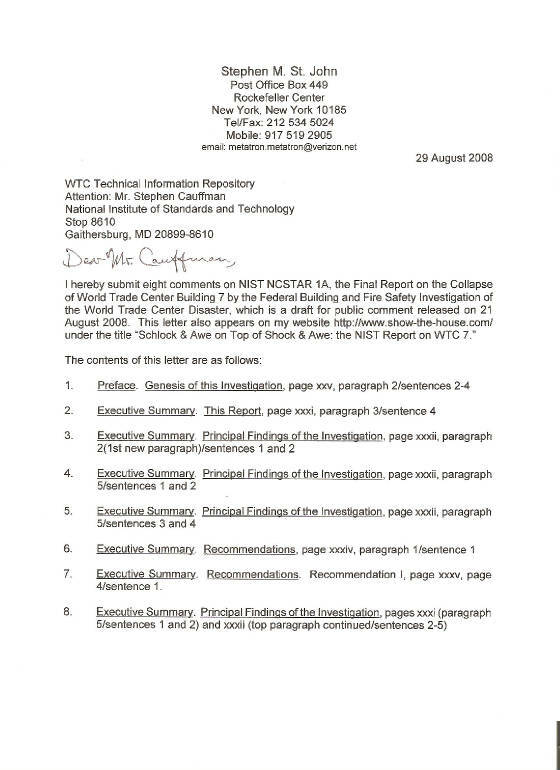 As demonstrated in the letter below to the National Institute of Standards & Technology (NIST), its final report on the mysterious collapse of the Salomon Brothers Building, otherwise known as World Trade Center 7, on 11 September 2001, is wholly inadequate with respect to the establishment of historical truth and the pursuit of justice. The report has a putative legal basis from an illegal ex post facto law. NIST acts in combination with other entities to suppress evidence and the legal discovery process. NIST makes fanciful inferences to explain phenomena never encountered in the long history of steel structured buildings. 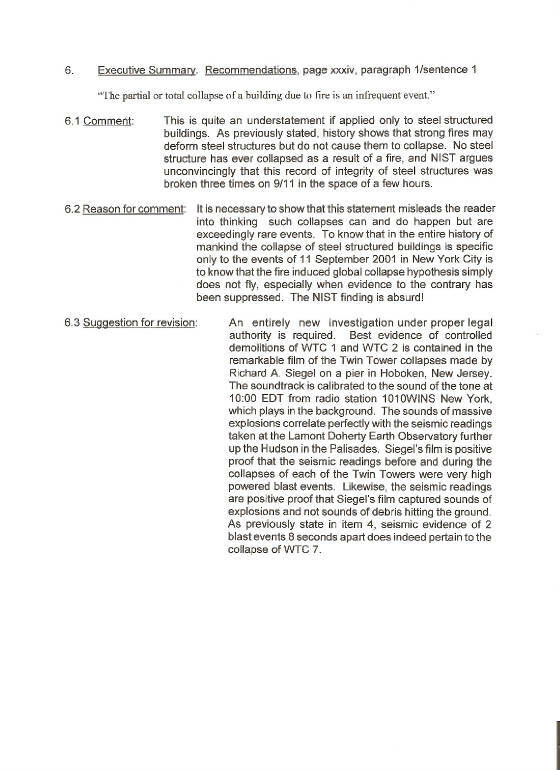 NIST excludes clear evidence of seismic blast events that were coincidental to not only to the collapse of WTC 7, but also WTC 1 and WTC 2. NIST excludes other evidence of controlled demolition and foreknowledge of controlled demolition. NIST does not put under proper scrutiny the strange but telling behavior of Sir Rudolph Giuliani, who as New York City Mayor on Black Tuesday, carefully avoided his state of the art emergency command post on the 23rd floor of World Trade Center 7. Why? Streams of molten metal at Ground Zero contradict assertions of fire-induced global (mechanical) collapse from ordinary building contents and even jet fuel. Read more below. I hereby submit eight comments on NIST NCSTAR 1A, the Final Report on the Collapse of World Trade Center Building 7 by the Federal Building and Fire Safety Investigation of the World Trade Center Disaster, which is a draft for public comment released on 21 August 2008. 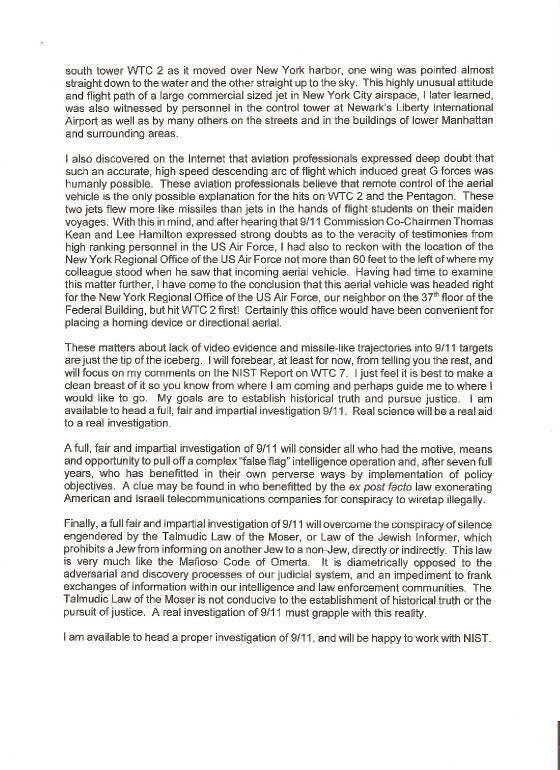 This letter also appears on my website http://www.show-the-house.com/ under the title "Schlock & Awe on Top of Shock & Awe: the NIST Report on WTC 7." "On October 1, 2002, the National Construction Safety Team Act (Public Law 107-231) was signed into law. (A copy of the Public Law is included in Appendix A.) The NIST WTC Investigation was conducted under the authority of the National Construction Safety Team Act." 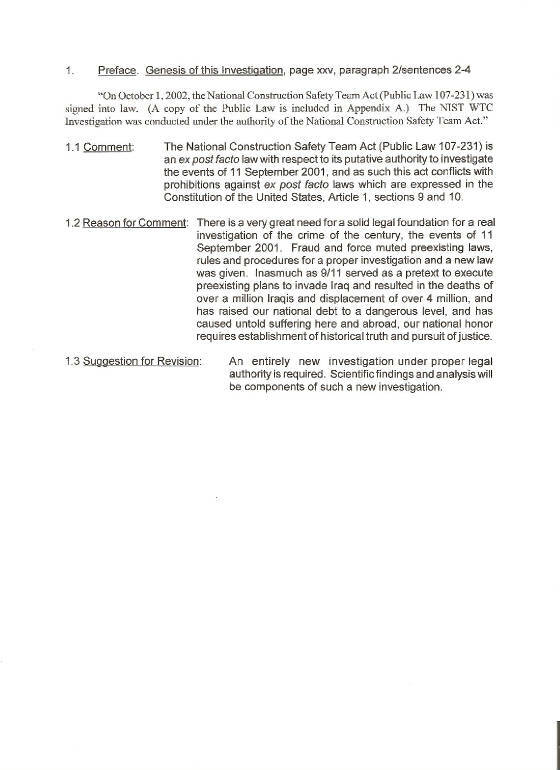 1.1 Comment: The National Construction Safety Team Act (Public Law 107-231) is an ex post facto law with respect to its putative authority to investigate the events of 11 September 2001, and as such this act conflicts with prohibitions against ex post facto laws which are expressed in the Constitution of the United States, Article 1, sections 9 and 10. 1.2 Reason for Comment: There is a very great need for a solid legal foundation for a real investigation of the crime of the century, the events of 11 September 2001. Fraud and force muted preexisting laws, rules and procedures for a proper investigation and a new law was given. Inasmuch as 9/11 served as a pretext to execute preexisting plans to invade Iraq and resulted in the deaths of over a million Iraqis and displacement of over 4 million, and has raised our national debt to a dangerous level, and has caused untold suffering here and abroad, our national honor requires establishment of historical truth and pursuit of justice. 1.3 Suggestion for Revision: An entirely new investigation under proper legal authority is required. Scientific findings and analysis will be components of such a new investigation. "However, the reader should keep in mind that the building and the records kept within it were destroyed, and the remains of all the WTC buildings were disposed of before congressional action and funding was available for this Investigation to begin." 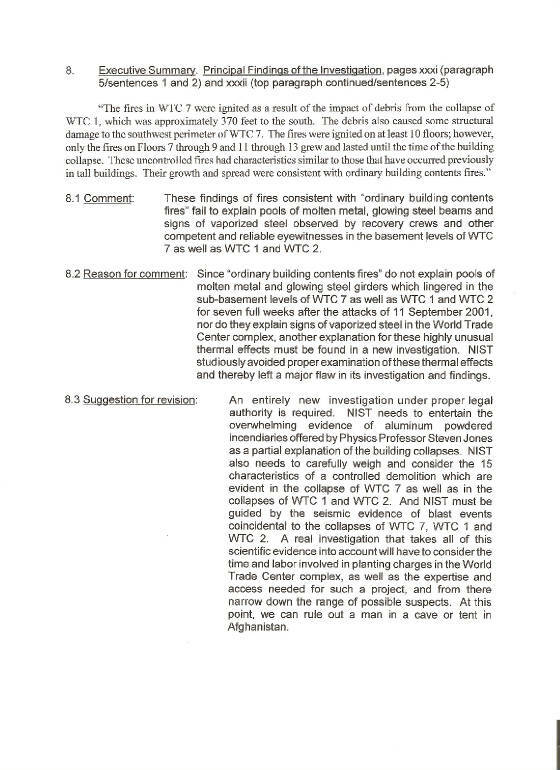 2.1 Comment: This sentence in this NIST Report on the mysterious collapse of World Trade Center 7 is a classic example of what the founding fathers of the USA sought to prevent happening in our republic when they included two prohibitions against ex post facto laws in Article I, sections 9 and 10 of our Constitution. 2.2 Reason for comment: It must be pointed out that this NIST Report rests on the false assumption that there was no preexisting agency authorized to investigate Ground Zero in New York during the long interval between the 9/11 attacks and the 1 October 2002 passage of the National Construction Safety Team Act. Our Congress acted in combination with local, state and federal officials and private entities to countenance the illegal removal of evidence from a crime scene and the suppression of a legal discovery process and thereby thwarted a proper criminal investigation and redress for victims and their survivors. This game of legal thimblerig does not conduce to the establishment of historical truth and the proper administration of justice. Such corruption supported the stated goals of the war mongers who had the motive, means and opportunity to carry out a false flag intelligence operation and did in fact benefit by fulfillment of policy objectives. NIST has been used to lend a veneer of authority and respectability to an assault on our justice system. 2.3 Suggestion for revision: An entirely new investigation under proper legal authority is required. Matters of law are not subservient to affairs of state which are totally unhinged from the Constitution of the United States and international law. A scientific report teetering on such shaky legal foundation naturally has as much to hide as it reveals, and I list in items 3 through 8 below the notable false statements, omissions and unsupported assertions in this report. 2.3.1 Background But first, let me say I know I sound somewhat harsh in my assertions, but please believe me that I address these heavy issues with sincerity and deep concern. I am not blaming everybody at NIST or other federal, state and local government agencies and private entities. I realize that in this age of specialization, people play compartmentalized roles and very often do not have a clear look at the big picture. We all have our prejudices too, and must keep them in check so as not to affect our judgments. We also live in an age of technological wonders that can be devilishly deceiving. We must be on guard at all times. Before I continue in this fault finding exercise, let me tell you that I was a federal employee working out of the New York Regional Office of the US Department of Commerce on 9/11. I lost my boss, our Assistant Regional Director, Marion Britton, who, I've been told, was on United Airlines Flight 93 which, I've been told, went down near Shanksville, Pennsylvania. I only know I never saw Marion again after 9/11. The empty ditch in the field looked like a bomb crater. And debris was scattered as far as 8 miles to the east in New Baltimore. 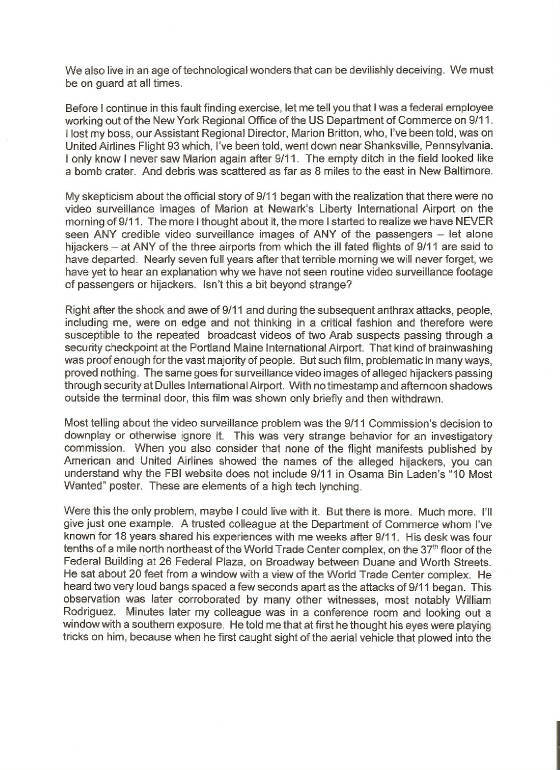 My skepticism about the official story of 9/11 began with the realization that there were no video surveillance images of Marion at Newark's Liberty International Airport on the morning of 9/11. The more I thought about it, the more I started to realize we have NEVER seen ANY credible video surveillance images of ANY of the passengers – let alone hijackers – at ANY of the three airports from which the ill fated flights of 9/11 are said to have departed. Nearly seven full years after that terrible morning we will never forget, we have yet to hear an explanation why we have not seen routine video surveillance footage of passengers or hijackers. Isn't this a bit beyond strange? Right after the shock and awe of 9/11 and during the subsequent anthrax attacks, people, including me, were on edge and not thinking in a critical fashion and therefore were susceptible to the repeated broadcast videos of two Arab suspects passing through a security checkpoint at the Portland Maine International Airport. That kind of brainwashing was proof enough for the vast majority of people. But such film, problematic in many ways, proved nothing. The same goes for surveillance video images of alleged hijackers passing through security at Dulles International Airport. With no timestamp and afternoon shadows outside the terminal door, this film was shown only briefly and then withdrawn. Most telling about the video surveillance problem was the 9/11 Commission's decision to downplay or otherwise ignore it. This was very strange behavior for an investigatory commission. When you also consider that none of the flight manifests published by American and United Airlines showed the names of the alleged hijackers, you can understand why the FBI website does not include 9/11 in Osama Bin Laden's "10 Most Wanted" poster. These are elements of a high tech lynching. Were this the only problem, maybe I could live with it. But there is more. Much more. I'll give just one example. A trusted colleague at the Department of Commerce whom I've known for 18 years shared his experiences with me weeks after 9/11. His desk was four tenths of a mile north northeast of the World Trade Center complex, on the 37th floor of the Federal Building at 26 Federal Plaza, on Broadway between Duane and Worth Streets. He sat about 20 feet from a window with a view of the World Trade Center complex. He heard two very loud bangs spaced a few seconds apart as the attacks of 9/11 began. This observation was later corroborated by many other witnesses, most notably William Rodriguez. Minutes later my colleague was in a conference room and looking out a window with a southern exposure. He told me that at first he thought his eyes were playing tricks on him, because when he first caught sight of the aerial vehicle that plowed into the south tower WTC 2 as it moved over New York harbor, one wing was pointed almost straight down to the water and the other straight up to the sky. This highly unusual attitude and flight path of a large commercial sized jet in New York City airspace, I later learned, was also witnessed by personnel in the control tower at Newark's Liberty International Airport as well as by many others on the streets and in the buildings of lower Manhattan and surrounding areas. I also discovered on the Internet that aviation professionals expressed deep doubt that such an accurate, high speed descending arc of flight which induced great G forces was humanly possible. These aviation professionals believe that remote control of the aerial vehicle is the only possible explanation for the hits on WTC 2 and the Pentagon. These two jets flew more like missiles than jets in the hands of flight students on their maiden voyages. With this in mind, and after hearing that 9/11 Commission Co-Chairmen Thomas Kean and Lee Hamilton expressed strong doubts as to the veracity of testimonies from high ranking personnel in the US Air Force, I had also to reckon with the location of the New York Regional Office of the US Air Force not more than 60 feet to the left of where my colleague stood when he saw that incoming aerial vehicle. Having had time to examine this matter further, I have come to the conclusion that this aerial vehicle was headed right for the New York Regional Office of the US Air Force, our neighbor on the 37th floor of the Federal Building, but hit WTC 2 first! Certainly this office would have been convenient for placing a homing device or directional aerial. These matters about lack of video evidence and missile-like trajectories into 9/11 targets are just the tip of the iceberg. I will forebear, at least for now, from telling you the rest, and will focus on my comments on the NIST Report on WTC 7. I just feel it is best to make a clean breast of it so you know from where I am coming and perhaps guide me to where I would like to go. My goals are to establish historical truth and pursue justice. I am available to head a full, fair and impartial investigation 9/11. Real science will be a real aid to a real investigation. A full, fair and impartial investigation of 9/11 will consider all who had the motive, means and opportunity to pull off a complex "false flag" intelligence operation and, after seven full years, who has benefitted in their own perverse ways by implementation of policy objectives. A clue may be found in who benefitted by the ex post facto law exonerating American and Israeli telecommunications companies for conspiracy to wiretap illegally. Finally, a full fair and impartial investigation of 9/11 will overcome the conspiracy of silence engendered by the Talmudic Law of the Moser, or Law of the Jewish Informer, which prohibits a Jew from informing on another Jew to a non-Jew, directly or indirectly. This law is very much like the Mafioso Code of Omerta. It is diametrically opposed to the adversarial and discovery processes of our judicial system, and an impediment to frank exchanges of information within our intelligence and law enforcement communities. The Talmudic Law of the Moser is not conducive to the establishment of historical truth or the pursuit of justice. A real investigation of 9/11 must grapple with this reality. I am available to head a proper investigation of 9/11, and will be happy to work with NIST. "Eventually, the fires reached the northeast of the building. The probable collapse sequence that caused the global collapse of WTC 7 was initiated by the buckling of a critical interior column in that vicinity." 3.1 Comment: History shows that severe fires deform but do not collapse steel structures. 3.2 Reason for comment: I am at a loss to understand how NIST can conceivably make the leap to fire-induced mechanical collapse at virtually free fall speed when no fire has ever done this to a steel structured building except on 9/11. NIST's strained inference is rendered plausible only by computer graphic gimmickry and suppression and exclusion of contradictory evidence. 3.3 Suggestion for revision: An entirely new investigation under proper legal authority is required. Such investigation will consider responsible dissenting views such as those expressed by Mr. Richard Gage and his Architects & Engineers for 9/11 Truth. Fifteen different characteristics of a controlled demolition have been described and identified in the collapses of WTC 7, 1 and 2. 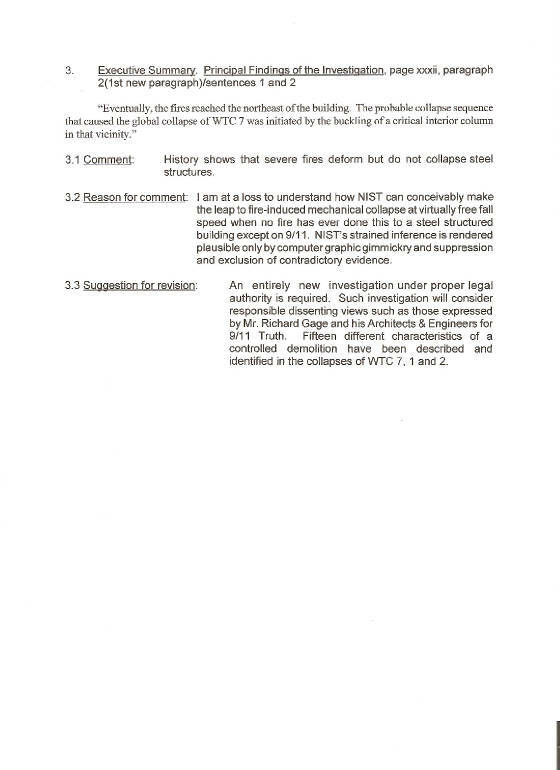 "Hypothetical blast events did not play a role in the collapse of WTC 7. NIST concluded that blast events did not occur, and found no evidence whose explanation required invocation of a blast event." 4.1 Comment: These statements are false and misleading. The Lamont Doherty Earth Observatory of Columbia University recorded two seismic events at 17:20:42 and 17:20:50 EDT, exactly when WTC 7 collapsed. Each of the two seismic events registered 0.6 on the Richter scale, which is comparable to a typical quarry blast at distances even greater than the WTC from the seismograph's sensors. So it is indeed curious that NIST uses the plural form ("hypothetical blast events") even as it excludes mention of these two seismic events in this executive summary. 4.2 Reason for comment: The Lamont Doherty Earth Observatory's definite seismic evidence of two blast events coinciding with the collapse of World Trade Center 7 needs to be pointed out, as it supports a conclusion of controlled demolition rather than NIST's fire induced global (mechanical) collapse theory. It also needs to be pointed out that although clear evidence of blast events from seismic recordings appears in Figures B-2 and B-9 of NIST's NCSTAR 1-9, WTC Investigation (pages 652 and 667 respectively), the authors of this executive summary totally ignore and otherwise avoid their very own strong evidence that real blast events did play a role in the collapse of WTC 7. Such gross neglect or lack of candor undermines this finding. After shock and awe, we are getting schlock and awe! Americans and the international community deserve better. 4.3 Suggestion for revision: An entirely new investigation under proper legal authority is required. Such investigation will not ignore seismic evidence of blast events coinciding with the collapse of WTC 7. Such investigation will also review seismic evidence of blast events coinciding with the collisions of aerial vehicles into WTC 1 & 2 and the collapses of WTC 1, 2 & 7. Such investigation will consider the engineered resilience of the Twin Towers' structures as well as the man-made and natural surface layers in, around and under the World Trade Center complex as factors precluding building collapses and impacts of aerial vehicles as seismic events. "Blast from the smallest charge capable of failing the critical column would have resulted in a sound level of 130 dB to 140 dB at a distance of at least half a mile. There were no witness reports of such a loud noise, nor was such a noise heard on the audio tracks of video recordings of the WTC 7 collapse." 5.1 Comment: These are false statements offering slight information when there is much more. Contrary to what the NIST Report says, there were indeed eyewitness accounts of explosions heard and shock waves seen right before and during the collapse of WTC 7 just before 5:21 PM on 11 September 2001. 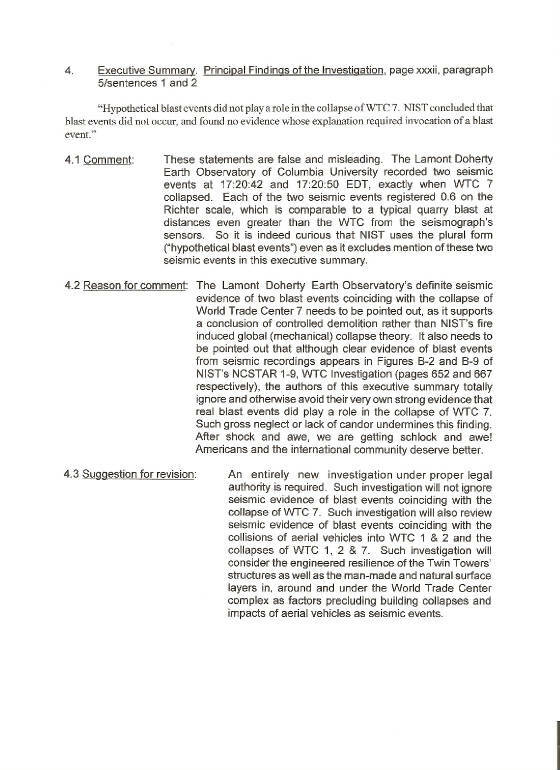 5.2 Reason for comment: NIST is making a false statement to the effect that there were no eyewitness testimonies to the sounds of explosions before and during the collapse of WTC 7. Such false statements, compounded by suppression of seismic evidence as shown in item 4 and other scientific evidence as shown in item 8, can only lead to wrong conclusions. 5.3 Suggestion for revision: An entirely new investigation under proper legal authority is required. Eyewitnesses who heard and recorded explosions with their video cameras should be properly deposed and not excluded from consideration. Ground noise, the muffling effects of buildings and building materials and other objects must be taken into account in determining why there were witnesses who did not hear or record the sounds of explosions. In this regard, Professor Steven Jones, a leading exponent of aluminum powder incendiaries as one of the methods employed in the controlled demolitions of WTC 1, 2 and 7, whose voice has been muffled by the mainstream news media, can attest to the relative quiet of these kinds of explosives. I have seen on the Internet videos with soundtracks including sounds of explosions before and during the collapse of WTC 7. If these are fake, they ought to be exposed as fake and the perpetrators should be prosecuted to the full extent of the law. Also to be considered are numerous testimonies indicating foreknowledge of the impending implosion, including Larry Silverstein's famous admission that a decision was made to "pull it"; i.e., bring down WTC 7 by controlled demolition. How the BBC managed to report the collapse as a fait accompli twenty minutes before it actually happened deserves thorough examination. "The partial or total collapse of a building due to fire is an infrequent event." 6.1 Comment: This is quite an understatement if applied only to steel structured buildings. As previously stated, history shows that strong fires may deform steel structures but do not cause them to collapse. No steel structure has ever collapsed as a result of a fire, and NIST argues unconvincingly that this record of integrity of steel structures was broken three times on 9/11 in the space of a few hours. 6.2 Reason for comment: It is necessary to show that this statement misleads the reader into thinking such collapses can and do happen but are exceedingly rare events. To know that in the entire history of mankind the collapse of steel structured buildings is specific only to the events of 11 September 2001 in New York City is to know that the fire induced global collapse hypothesis simply does not fly, especially when evidence to the contrary has been suppressed. The NIST finding is absurd! 6.3 Suggestion for revision: An entirely new investigation under proper legal authority is required. Best evidence of controlled demolitions of WTC 1 and WTC 2 is contained in the remarkable film of the Twin Tower collapses made by Richard A. Siegel on a pier in Hoboken, New Jersey. The soundtrack is calibrated to the sound of the tone at 10:00 EDT from radio station 1010WINS New York, which plays in the background. The sounds of massive explosions correlate perfectly with the seismic readings taken at the Lamont Doherty Earth Observatory further up the Hudson in the Palisades. Siegel's film is positive proof that the seismic readings before and during the collapses of each of the Twin Towers were very high powered blast events. Likewise, the seismic readings are positive proof that Siegel's film captured sounds of explosions and not sounds of debris hitting the ground. As previously state in item 4, seismic evidence of 2 blast events 8 seconds apart does indeed pertain to the collapse of WTC 7. "Establishment and implementation of codes and protocols for ensuring effective and uninterrupted operation of the command and control system for large-scale building emergencies." 7.1 Comment: This recommendation raises a very pertinent question. Why did Mayor Rudolf Giuliani prefer an impromptu command post in the field at 75 Barclay Street to his expensive, state of the art emergency command post on the 23rd floor of WTC 7? 75 Barclay Street is approximately 60 feet from the Barclay Street entrance of WTC 7, or the distance a baseball thrown by Nolan Ryan will travel in the blink of an eye. Giuliani's decision to stay away from WTC 7 was made well before any damage was inflicted on the building. In fact, in this time frame Giuliani expressed foreknowledge of the collapse of WTC 2 in a live interview with Peter Jennings of ABC News. 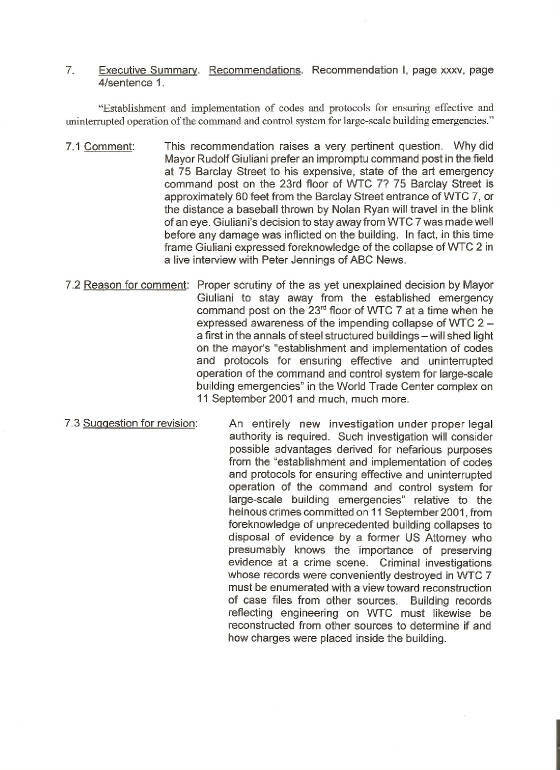 7.2 Reason for comment: Proper scrutiny of the as yet unexplained decision by Mayor Giuliani to stay away from the established emergency command post on the 23rd floor of WTC 7 at a time when he expressed awareness of the impending collapse of WTC 2 – a first in the annals of steel structured buildings – will shed light on the mayor's "establishment and implementation of codes and protocols for ensuring effective and uninterrupted operation of the command and control system for large-scale building emergencies" in the World Trade Center complex on 11 September 2001 and much, much more. 7.3 Suggestion for revision: An entirely new investigation under proper legal authority is required. 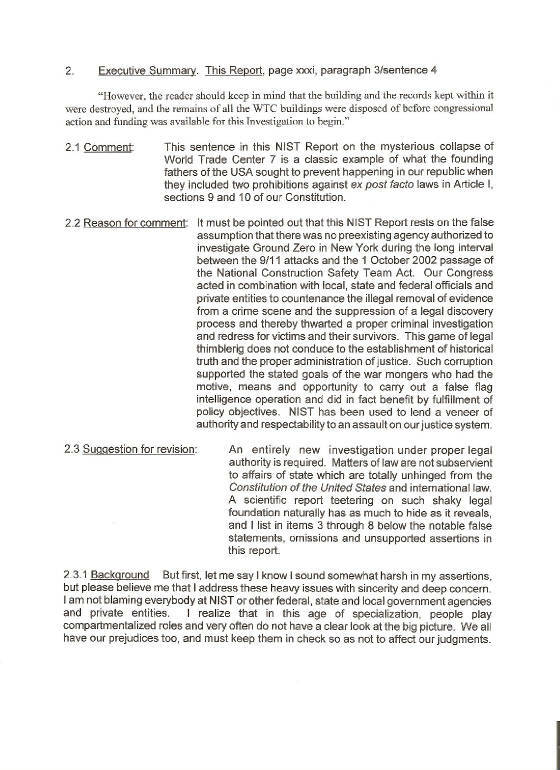 Such investigation will consider possible advantages derived for nefarious purposes from the "establishment and implementation of codes and protocols for ensuring effective and uninterrupted operation of the command and control system for large-scale building emergencies" relative to the heinous crimes committed on 11 September 2001, from foreknowledge of unprecedented building collapses to disposal of evidence by a former US Attorney who presumably knows the importance of preserving evidence at a crime scene. Criminal investigations whose records were conveniently destroyed in WTC 7 must be enumerated with a view toward reconstruction of case files from other sources. Building records reflecting engineering on WTC must likewise be reconstructed from other sources to determine if and how charges were placed inside the building. "The fires in WTC 7 were ignited as a result of the impact of debris from the collapse of WTC 1, which was approximately 370 feet to the south. The debris also caused some structural damage to the southwest perimeter of WTC 7. The fires were ignited on at least 10 floors; however, only the fires on Floors 7 through 9 and 11 through 13 grew and lasted until the time of the building collapse. These uncontrolled fires had characteristics similar to those that have occurred previously in tall buildings. Their growth and spread were consistent with ordinary building contents fires." 8.1 Comment: These findings of fires consistent with "ordinary building contents fires" fail to explain pools of molten metal, glowing steel beams and signs of vaporized steel observed by recovery crews and other competent and reliable eyewitnesses in the basement levels of WTC 7 as well as WTC 1 and WTC 2. 8.2 Reason for comment: Since "ordinary building contents fires" do not explain pools of molten metal and glowing steel girders which lingered in the sub-basement levels of WTC 7 as well as WTC 1 and WTC 2 for seven full weeks after the attacks of 11 September 2001, nor do they explain signs of vaporized steel in the World Trade Center complex, another explanation for these highly unusual thermal effects must be found in a new investigation. NIST studiously avoided proper examination of these thermal effects and thereby left a major flaw in its investigation and findings. 8.3 Suggestion for revision: An entirely new investigation under proper legal authority is required. NIST needs to entertain the overwhelming evidence of aluminum powdered incendiaries offered by Physics Professor Steven Jones as a partial explanation of the building collapses. NIST also needs to carefully weigh and consider the 15 characteristics of a controlled demolition which are evident in the collapse of WTC 7 as well as in the collapses of WTC 1 and WTC 2. And NIST must be guided by the seismic evidence of blast events coincidental to the collapses of WTC 7, WTC 1 and WTC 2. A real investigation that takes all of this scientific evidence into account will have to consider the time and labor involved in planting charges in the World Trade Center complex, as well as the expertise and access needed for such a project, and from there narrow down the range of possible suspects. At this point, we can rule out a man in a cave or tent in Afghanistan. In light of the eight comments outlined above, I reiterate the very strong need for a real investigation of the events of 11 September 2001. 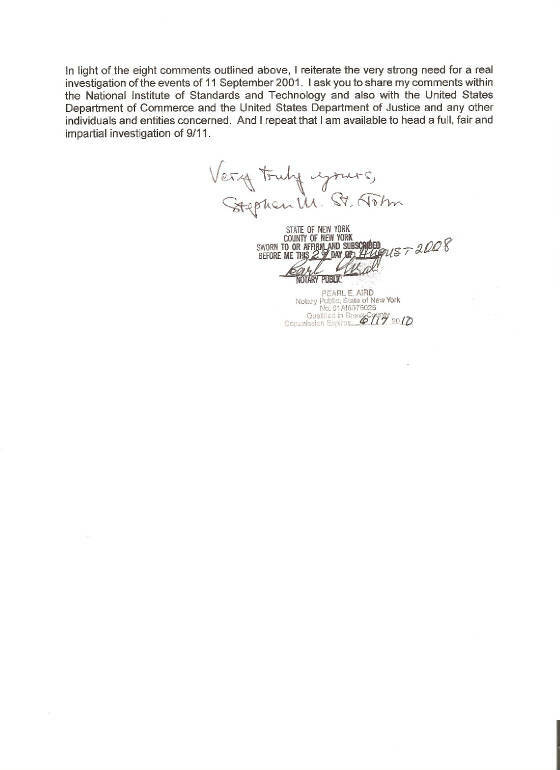 I ask you to share my comments within the National Institute of Standards and Technology and also with the United States Department of Commerce and the United States Department of Justice and any other individuals and entities concerned. And I repeat that I am available to head a full, fair and impartial investigation of 9/11.